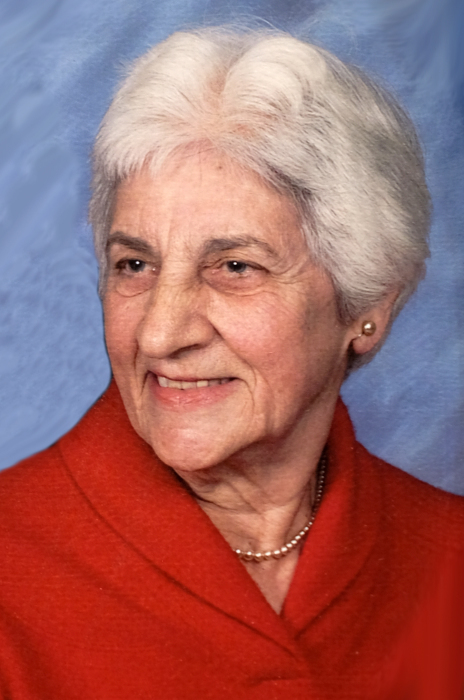 Marie Rapacchia Lynn, was born to the late Pasquale and Elizabeth (Chicchi) Rappachia on January 22nd 1931 in Bethlehem, PA. She was brave and independent, respectful and kind, an active member of the church, a great chef, and an even better mother and grandmother. After graduating from Liberty High School in 1948 and then Allentown Beauty School, Marie was a successful entrepreneur running Marie’s Beauty Salon. Marie’s business was in bringing out the spirits of her clients by giving them the look that made them feel their best self. She closed her salon upon marrying Alexander Lynn, or Al as she affectionately called him, but she continued to cut and style hair throughout her life for friends, children, and later grandchildren. She was so skilled with scissors that her grandchildren thought that every grandmother came into the world with the knowledge of cosmetology. Marie used her own money that she earned from cutting hair to buy surprise Christmas, birthday, and Father’s day gifts for Al. Especially to Al, from the moment they met at a community dance in Bethlehem, PA, Marie was the most beautiful person in body, mind, and soul. The memories Marie made with Al in their more than sixty-two years together fill two lifetimes with happiness and laughter, which they often shared with others while delivering Meals on Wheels, at church, or by the warmth of their kitchen stove. A stronger and more passionate love we have never seen, and Marie’s death will not diminish that fierce bond that has taken new shape between them. Somehow among all of the community activities she led or led together with Al, Marie raised four children who are successful individuals with strong values. We believe she accomplished this feat with a hearty mix of loving support for her children’s endeavors and of stubborn willfulness that could miraculously outlast that of her children. While her children were growing up, Marie kept them actively learning by founding the intrepid group known as the Astrocooks, a 4-H Club that she conducted for 16 years. Marie’s children gained countless skills and experiences from this club, and they defend its unique name, part explorer and part domestic, by stating that Marie ran the organization democratically and that it was the 1970s, after all. Marie was with us, her family and friends, for every success and every tragedy of our lives. For every cross-country meet, basketball game, cheerleading practice, and concert, Marie was there. For every birth, every death, every funeral, and every marriage, she was there, always with a hug and a delicious plate of food. Some of our best stories with Marie are of her surrounded by friends and family and gorgeous meals. Whether she was passing on her Italian heritage in her kitchen making cavatelli with her children or she was passing out fried dough to raise funds for the church or for Little League, Marie was at the center of a throng of people who could hardly wait to be in her presence. Marie has shared her recipes with all of us, from Whoppee pies to Christmas Kiffels to authentic Italian biscotti. Some of these recipes she wrote down by hand on plain white index cards for each individual who wanted them, and others she wrote into the Country Cooking book, a project she created and led in 1972 as President of the Rosary for her church. Marie Rappachia Lynn died as she lived: surrounded by the family who love her. On Friday, July 13, after a mercifully short battle with cancer, she died in the loving arms of her husband and children. Marie was preceded in death by a brother Massimo ‘Tommy’ Rapacchia. Parts of Marie’s spirit live on in those of her survivors, including her husband Al Lynn, her sisters Ann Zelko and Theresa Mitchell, her four children Sandy Smith (Daniel), Marybeth List (Frederick), Rebecca Lynn, and Jeff Lynn (Elizabeth), and her seven grandchildren Ryan and Sean Smith, Sara, Rachel, and Abbey List, and Nicolas and Gabriel Lynn-Toledo. The rest of Marie’s spirit has no doubt begun her next adventure raising hell in heaven. Marie taught us to cook well in order to eat well, to laugh long in order to live long, to look good in order to feel good, to sit down with family in order to stand up when they need you, and most of all, that for your loved ones, the welcome mat is always out. In lieu of flowers, donations in memory of Marie Lynn may be made to Community Hospice in Albany, NY or to Our Lady of Fatima Church in Delanson, NY. For those wishing to mourn her passing and celebrate her life, we invite you to a viewing at the White-Van Buren Funeral Home in Delanson on Wednesday, July 18th from 6:00 – 8:00 PM. On Thursday, July 19th, we will also have a memorial service including a Catholic mass at Our Lady of Fatima Church in Delanson at 10:00 AM with a reception to follow at 1:00 PM at Riverstone Manor in Glenville, NY.